The Seahawks' 2018 first-round pick did not receive a carry behind running backs Chris Carson and Mike Davis in the loss to the Rams last week. So where does he go from here? The Seahawks carried the ball 32 times for 190 yards in their 33-31 loss to the Rams on Sunday. Their rookie first-round pick was not a part of that success. That doesn’t mean Rashaad Penny wasn’t active or available to play. But, outside of a kickoff he caught in the end zone for a touchback in the first quarter, the 27th overall choice in the 2018 NFL draft was notably absent the rest of the way. Through five games, 2017 seventh-round pick Chris Carson leads Seattle with 64 carries, 293 rushing yards, two 100-yard rushing performances and 73.3 rushing yards per game. And when Carson missed the Arizona game with a hip injury, former fourth-round choice Mike Davis stepped in, delivering 21 carries for 101 yards and two touchdowns. Against the Rams, Carson and Davis gobbled up 31 of the team’s 32 total carries. So, five games into his NFL career, is Penny already the forgotten man? “He’s just looking for his opportunity,” Seahawks coach Pete Carroll said Tuesday. “He’s dying to get in there. He’s just scratching and clawing to get back out there and get more turns. There just wasn’t enough (opportunities). That “good stuff” essentially amounts to 29 carries for 92 yards (3.2 YPC) and four catches for 35 yards in five games. It didn’t help, either, that Penny was forced to miss his team’s final three exhibition games — and plenty more practices — with a broken finger. “I didn’t play like half of the preseason and I didn’t practice, so I didn’t get an opportunity to run and make cuts when all of those other guys did. They had all that,” Penny said Tuesday. “I’m a rookie. It’s my first year, so it’s just something I have to get used to. I’m confident in myself that I can do the things they can, but like I said, they’ve got the hot hand and they’re great running backs in their own right. They’re doing amazing. Penny encountered a similar situation during his college career at San Diego State. For three seasons, he served as the team’s No. 2 running back behind Aztec standout Donnel Pumphrey. He earned a total of 63 carries (or 2.6 carries per game) in his first 24 games. Then, in his junior season, Penny produced 1,018 rushing yards, 7.5 yards per carry and 11 touchdowns. And in his lone season as the starter, he led the country with 2,248 rushing yards and scored 23 touchdowns in 2017. Though, to be clear, Penny would like to dispel the notion that “sitting and waiting” is all he’s doing. “I was never at 236 (pounds). 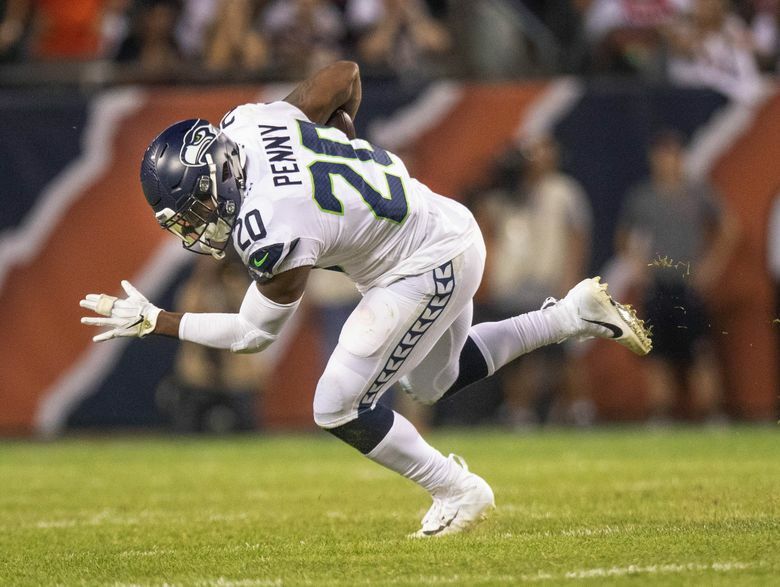 I was never at 240,” said Penny, after Carroll casually mentioned to the media during training camp in August that the running back had weighed in at 236. “I was never big. It’s just how I am. At the combine I wasn’t even 220, so all the reports about all that is crazy. That “best weight,” by the way, is either 226 or 227 pounds, per Penny. He was listed at 220 pounds during his four-year career at San Diego State. But, measurements aside, don’t expect Penny’s role to see a sudden expansion in London against the 1-4 Raiders on Sunday. The Seahawks have produced a 100-yard rusher in three consecutive games, with both Carson and Davis solidifying their standing in the rotation. That doesn’t leave many opportunities — to borrow Carroll’s word — for the 22-year-old rookie to prove he was worth the pick. Though, if you ask Penny, “frustrated” isn’t the right word.